Acer has rolled out 30 models of notebooks under its prime selling brand, the ‘Aspire’ series. The notebooks are catalogued under five series — S, M, V3, V5 and E — and powered by Intel second generation core processors. The Aspire Timeline Ultra M, its new premier model is priced at Rs 51,999 and the E series at Rs 24,749. At the top of the Acer food chain, the Acer Aspire Timeline Ultra M series, with 20 mm thickness and a base weight of 2.3 kg, is powered by a dedicated NVIDIA GeForce graphics card and is also the first 15-inch Ultrabook to have an optical drive with an optimum storage capacity and an eight-hour battery. An ‘instant connect’ feature on the Ultrabook offers a four-time faster connectivity to the internet stacked with the Acer display technology, a clear display for HD videos, adding another value to the new series of notebooks. 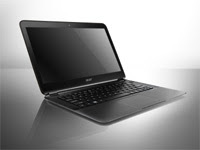 Acer, who on Tuesday released the notebooks, claims that the new models “would redefine the notebooks in the future”.